The first known museum in recorded history was opened in Alexandria, back in the 3rd century BC. Since then, museums have come a long way, and are responsible for treasuring and storing all remnants of human history. If you go to a museum, you will come across the earliest written books, the first airplane that ever flew, and even remnants of animals that once walked the earth millions of years ago. Today, museums are seen in every city, in every part of the world. They act as valuable storage houses for the history of human civilization and the evolution of life on this planet. 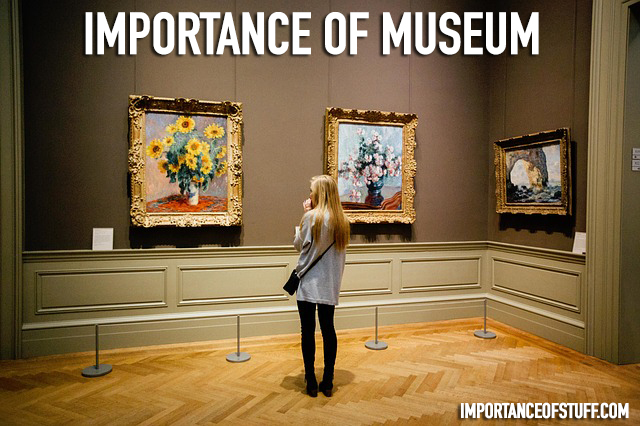 In this article, we will discuss the importance that museums hold in our lives. The principal role of museums today of course is the preservation of history. Museums store artifacts that have significant cultural, religious, scientific, and historical value; objects that denote significant turning points in the history of mankind and of the planet in general. It is thanks to the museums that we can look and objects that marked significant achievements by man. They provide tangible proof of history and help us identify ourselves in context. Museums help in preserving the cultural remnants, and provide proof of man’s survival through the ages. It is through museums that we can get a solid, evidence backed glimpse into our past. The museum holds a place of prime importance in the field of education. Any education is incomplete without proper cultural education and awareness, and museums play an undeniable role in this respect. A museum holds the cultural history of a nation and its many inhabitants, along with the history of other cultures as well. The only other mode of imparting cultural history to a nation would be through verbal dissertations, and that is not as effective as museums since it lacks the element of being able to interact and physically see and touch the artifacts being presented. It is impossible for mankind to progress if we are not aware of our past, and museums provide the only window to our history. The artifacts stored and displayed in museums help us to understand where we came from, and thus determine where we are going. For instance, the Holocaust museums in different parts of the world help us know about the immensely mindless atrocities that humans once committed against fellow humans, and that makes it possible for us to know why such atrocities should never be committed again. Similarly, the relics of a country’s great past in its museums invoke the spirit of nationality and propel the nation to stand up and be great again. Unity is necessary in order to ensure that people live in happiness and prosperity. Museums use their resources and ensure appreciation and solidarity among the various social and cultural groups that exists within a community, and thus promote unity in a society. This brings about greater understanding about the other cultures, thus paving the way for further appreciation and communal harmony. Today, communal and religious problems are driving the world apart, and museums, with their horde of cultural and religious artifacts, have the ability to promote understanding and appreciation of different cultures, encouraging people to embrace diversity and be peaceful in acceptance of difference. Museums are a great source of knowledge. There is something in every museum that will attract the interest of someone. They truly cater to every taste. If you are interested in scientific achievements, there are museums dedicated to such advancements made by mankind, staring from the invention of the ballpoint pen to the airplane. If you are interested in knowing the different cultures of the world, there are museums that house artifacts related to the smallest of details about the many different past and present cultures of the world. In fact, even the quirkiest of interests are catered to by museums, such as the famous Sulabh International Museum of Toilets in Delhi, India. There are museums dedicated to fashion, food, aviation, space, and what not; you name the subject, and you will find something in a museum related to it. Today, museums are sources of unparalleled knowledge. There is a great impact in viewing apart of history with your own eyes, right in front of you, and the experience can evoke a number of emotions. Being exposed to museums at a young age instills in children a wide range of feelings, from curiosity to nationalism. They are national treasures and should be preserved with utmost care, instead of the negligence many of them face in certain regions.